Ufone is among the top telecom networks in Pakistan. It introduces thousands of packages for its valued customers. 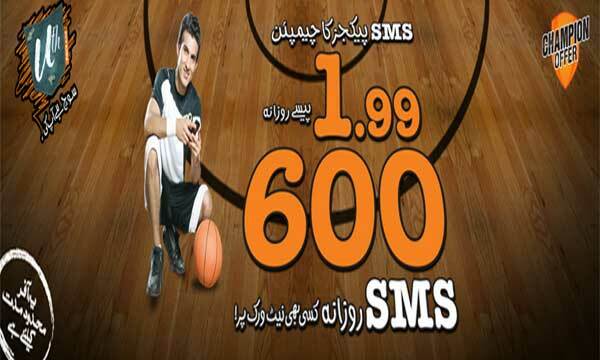 Recently, it launches Ufone uth champion offer for its users. No doubt, this is also an outstanding opportunity for the youngster. As you know, today’s generation loved to do chatting through SMS. Therefore, this telecom network keep the interest and demand of the youth in it mind and decided to bring it for you. It is great to have unlimited SMS facility on daily basis. It is so affordable and reasonable that anyone can utilize it easily. Therefore, don’t waste time and grape it now. Uth champion of ufone is especially for youth and you can enjoy texting U to U. it will only charge 1.99 Rs plus tax on daily bases and you will get 600 sms daily. Isn’t great? Yes, it is amazing. It is cheap so that everyone can afford it easily. If you want to enjoy texting with your friends or loved once then get it immediately. If you still don’t have SIM of this network then get it as soon as possible so that you can relish life by utilizing great youth package. It will save your time and money to spend on loading your mobile account again and again. Therefore, don’t miss chance to get it because it is limited offer. Once you miss it then you will never get this SMS facility again. So, grape this limited offer now and enjoy long hour SMS chatting with your friends and family members. The procedure is very simple and easy to subscribe it. You just need to dial its subscribing code then you can get it immediately. The code information is as follow for you. All the other details related to validity and remaining SMS checking are all information is given below for your reliability and comfort. You should make sure that while subscribing for it, no other offer is activated in your SIM. The use one offer at a time is enough for you. This offer is only for uth customers so to get it you have to subscribe for uth package first. After 24 hours, it will automatically re-subscribe so the user not have to re-subscribe it. It will charged extra 0.84% on all packages and services for Islamabad, gilgit and AJK users. This is limited time offer for all customers. You should use SIM that are bio-metrically verified because it is your identity.